Also, for your mana-base I would recommend 3 or 4x Scoured Barrens and 1 of each Secluded Steppe and Barren Moor . I would bet that Counterspell does not get reprinted. Modern has a really healthy and eclectic mix of counterspells being run right now, from Logic Knot to Remand to Mana Leak , etc. Wizards has been committed to the idea that Modern-legal counterspells cost three mana outright, or two mana with some sort of downside for a while, and I do not see that changing anytime soon. I also do not expect Sinkhole to be reprinted, as it is a bit of a colour-pie violation and Wizards is pretty anti-land destruction right now. 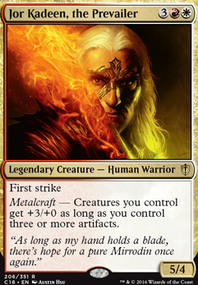 I would expect to see a heavy leaning toward reprints of cards in Commander products. These are cards that fit in with the current understanding of the colour pie and fit in well with the precon level of power. I do not expect to see many of the truly broken cards from the early stages of Magic--I expect Wizards intends to keep Modern a turn-four format. I know lots of people want Baleful Strix to be Modern, so I think that is a good bet. I don't think it is so gamebreaking as to disrupt the format. I think Aggravated Assault might be another good guess, as it was recently reprinted in Explorers of Ixalan. Toxic Deluge from Commander might be a good option. Wrath effects are already plentiful in Modern, though this one costs a mana less and can get by indestructible. I think there are a number of lands that will also see reprints, as they would be solid for Draft purposes. 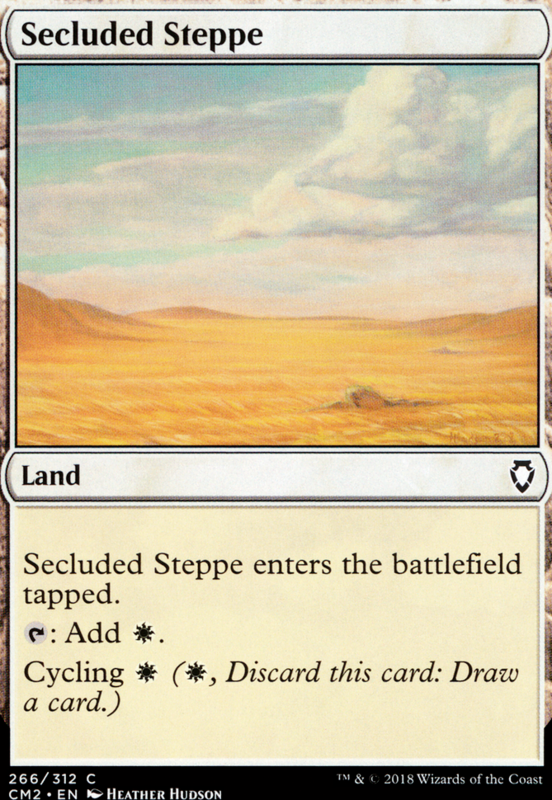 We recently had mono-coloured Cycle lands ( Desert of the True ) printed in standard, so I will not be surprised if a future Modern Horizon set has the slightly less-expensive-to-cycle lands of Onslaught ( Secluded Steppe ). Oddysey's Threshold lands, like Cephalid Coliseum could also be reprinted. As with every new proposed non-Standard set, I'm hoping for Banding to return. I have little expectation that will occur. Yeah, Shalai is illegal in mono white. 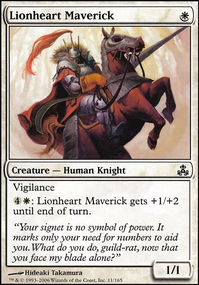 Commander uses something called color identity when determining a card's legality, which includes any colored symbol showing up on the card in addition to the card's color. 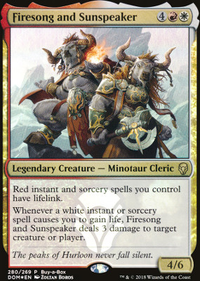 For example, Alesha Who Smiles At Death is a 3 color commander, not 1. Removal I'd recommend: Swords to Plowshares , Path to Exile , Return to Dust , Crush Contraband , Disenchant , Darksteel Mutation (excellent for commanders! ), Abolish and although not technically removal you should definitely run Mana Tithe . Cards I'd recommend removing from your deck: Danitha Capshen, Baird, Angelic Chorus, Oketra's Last Mercy, Immolating Glare, Reprisal, Invoke the Divine, Helm of the Host, Angelheart Vial. These ones don't do enough for their mana, are worse versions of other cards, or don't match your game plan. After that start cutting from the top of your angel curve. I didn't see a budget posted so some of these cards can be pricey, but hopefully that helps! For card draw in white you can use generic deck thinners to instead improve the quality of draws. Secluded Steppe , Drifting Meadow for example. Gift of Estates or Land Tax , Strata Scythe , Sword of the Animist options. Seer's Sundial , Mentor of the Meek , Tamiyo's Journal , Sea Gate Wreckage , Loreseeker's Stone actually draw stuff. Recursion? Elixir of Immortality , Restoration Specialist pretty solid. The most important thing to change first is the mana base. You might be able to get away with less than 24 lands ultimately, maybe 23 or even 22 if you lower your mana curve, but I'd start with the default of 24 and tweak from there. In addition to adding lands, switch out the 4x Azorius Guildgate for Tranquil Cove — it's strictly better because of the lifegain. You might also consider more mana fixing than a single dual playset, such as fetchlands ( Evolving Wilds ) or Ash Barrens . There's also Azorius Chancery . 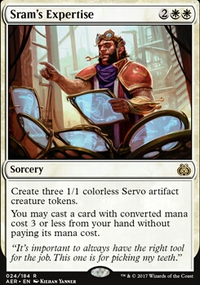 Since you run so many creatures, you might also be able to benefit from Holdout Settlement . Other than mana-fixing, some people also like cycling lands, as they can help you draw more useful cards when you get mana-flooded (like Lonely Sandbar and Secluded Steppe ). For control decks, Halimar Depths is a useful way to set up your draws. You can opt for incidental lifegain on lands like Kabira Crossroads , but I'd honestly stick with basic Plains, because you don't want too many lands that enter tapped. I noticed that more than one of your cards had an effect like "target creature an opponent controls doesn’t untap during its controller’s next untap step". If you wanted to focus you deck on that type of strategy, you could consider Skyline Cascade . So what to cut to make room for 8 more lands? 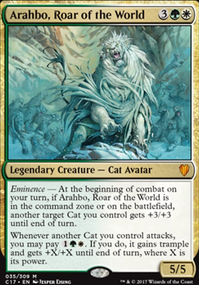 You could also considering cutting Sunspring Expedition , since effects that solely grant lifegain are generally considered not worth running (incidental lifegain, on the other hand, can be great). I'd also consider cutting Nimbus Wings , since most of your creatures already have flying. After making some of the above cuts and additions, really what you want to think about is what is your deck trying to DO. You want to have a unified strategy. For instance, right now you have creatures like Civic Stalwart , Haazda Officer , Pegasus Courser , and Vedalken Mesmerist that want you to be on the offensive. But you also have creatures with low power / high toughness (several of the ones I suggested you cut, actually), Syndicate Messenger (which makes for a great blocker), and Wall of Mist that want your deck to be defensive. A couple cards can swing both ways — AEther Adept and Chillbringer can either clear the board for your attacks, or they can slow down your opponent defensively. I think before we can make further suggestions, you'll need to better nail down the direction you want to take the deck — offensive flyers? high-toughness blockers and other stalling techniques to get to your win-con? You might consider Caves of Koilos , Scoured Barrens , Forsaken Sanctuary , Secluded Steppe , Myriad Landscape and Terramorphic Expanse instead of Piranha Marsh and some basic lands. Hello I certainly don't mind giving some suggestions, I do see that you have received some excellent feedback already, but I will try to add what I can to this. I figure this deck you're wanting to keep on the budget side am I correct in assuming? Regardless, I can see some areas where you can make significant improvement without spending too much $. The mana base is what i'm talking about here, I think you have a fine land count but what you can do is include some non-basics. Here are some to consider: Command Tower , Secluded Steppe , Orzhov Basilica , Temple of the False God , Myriad Landscape , Vault of the Archangel , Isolated Chapel , Temple of Silence , High Market , and Bojuka Bog . Of course there's others beyond this if you want to spend more like Cabal Coffers , Urborg, Tomb of Yawgmoth , Godless Shrine , Marsh Flats , etc but these are obviously more expensive. But yeah, your commander is a bit on the costly side, and you could do with some more ramp here. For one thing, with so many basic lands here I think you should consider adding Land Tax . I would swap Harvester of Souls for Midnight Reaper . Then, some other individual cards that I think would help here would be the following: Athreos, God of Passage (Was my first deck originally and is such a useful card here especially when paired with Teysa Karlov ), Emeria Shepherd , Bitterblossom , and Priest of Forgotten Gods . I wish I could offer more but I must get back to studying. Whenever I can, I will try to suggest some cuts that you can make possibly for some of these suggestions. The lands should be an easy part however to decide. Well I hope that some of this is of use to you for now.